Shhhh, I have a guilty secret! I eat something with chocolate in it every night! And these Double Chocolate Chocolate Brownies are the perfect treat! I am a real chocoholic. In fact, I think the term was invented with me in mind. At a very young age I decided that I would become a vegetarian. This would have been an alright move to make, if I had in fact liked eating fruit and vegetables. As a teenager, I devised a diet of eggs on toast with cheese and chutney for breakfast, chocolate éclairs for lunch and vegetables for supper. When I moved out of home, meal times became easier. The eggs were still a part of the diet, but now I could eat more chocolate! Tea time treats of chocolate ice cream were a necessity and a chocolate bar or two would suffice for snack time. Sometimes dessert would be in order, and that would be chocolate mousse. So, of course, I now know where my sucrose intolerance had its start. Even though I cannot eat sugar, I do not want to forego the chocolate in my diet. I will settle for a block or two of Canderel dark chocolate if I have not baked something but I would much rather bake something and have a decadent treat – one slice only, than be tempted by the whole bar of chocolate sitting on the table next to me. 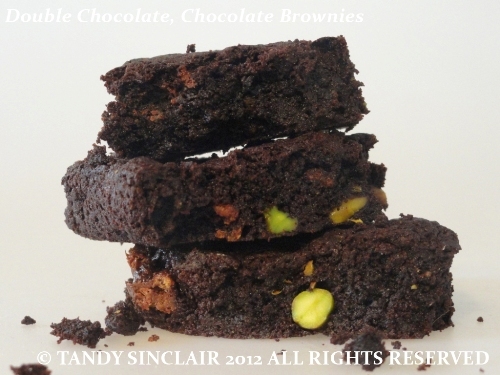 I have created a lot of recipes using chocolate but my chocolate brownie recipe is truly one of my top favourites. The nice thing about it is that you can adapt the optional extras to suit your taste buds and your dietary requirements. If you are diabetic, then change out the dried fruit for desiccated coconut for example. You can leave out the extras if you want to, or reduce or increase the amount you put in. Sometimes when I feel like an extra chocolate hit, I just add a slab of chocolate all broken up into the mix. These will keep, so if you are watching your waist line, well, be like me, and only have one of these as a treat. Is there something you have to eat after a meal that is a secret? This post was commissioned and paid for in conjunction with the Canderel Yellow “What’s Your Guilty Food Secret?” Competition. This is a great example of why I so love what you write, and so I’m nominating you for the Versatile Blogger Award. Some people prefer not to accept blog awards, and if you’re of that thinking, I hope that this nomination still brings new followers and friends to your blog. eggs on toast with cheese and chutney eh?…Yes,I think so! Yum. Tandy, they look delicious! Like you, I have to eat something chocolate every day too (in fact, many mornings I start with a chocolate shot – 100% cacao and a teaspoon of sugar in boiling water). Nut and dried fruit with little bit of chocolate chips would make a healthy recipe. I am the complete opposite I can take or leave chocolate. If there were two cakes on a table one choc the other vanilla I would probably pick the vanilla. we agree on the wine! I had to look up canderel granular sweetener as this is not a brand I see here in Hong Kong. I agree that just one little bite of chocolate a day does wonders for lifting the spirits. Splenda is the equivalent sucralose product 🙂 and I love the fact that chocolate is good for you! I’m sure that I would enjoy your chocolate indulgence. I eat one tiny bite of chocolate each night. I’ve never tried Canderel, in fact…I had to look it up online to find out what it was! Do you notice that it’s not sugar? I know that. it is the equivelent of Splenda. What a fabulous versatile recipe Tandy. Not so much a secret. But I do enjoy a piece of chocolate in the evening, sometimes just a single cube, and other times a whole lot more! Those chocolate brownies look devine!